Carmina Ohio - Cursed To First - Sox and Pats forever. My Dad describes the atmosphere in Columbus on Saturday, leading up to what some called the biggest college football game...ever. 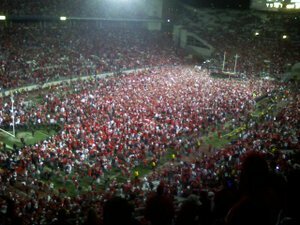 The aftermath of Ohio State's victory, from my dad's cell phone. Sports and emotion go hand in hand, and rivalries bring out emotion like nothing else. We in Boston have Red Sox-Yankees, of course, some folks have Alabama-Auburn, while others enjoy Harvard-Yale. However, in my opinion, for pure emotion, tradition, passion and excitement, the pinnacle of sports emotion is Ohio State vs Michigan in their annual season-ending football battle. I haven’t been to Ann Arbor for this epic experience, but I have been to Columbus twice. This year was exceptional, as both were undefeated AND ranked #1 and #2 for the national title. This game doesn’t need any extra emotion, but there it was: #1 and #2, and both teams were looking to become National Champion as well. The experience began for me at Logan airport Friday morning. Coming down the escalator from central parking I saw people dressed in their OSU garb. GO BUCKS was the phrase of the morning—in Boston! At the gate, scarlet and gray clad people were all talking only about the GAME. OSU grad and Celtic great John Havlichek was there with his wife, Beth, waiting with us for the trip back to THE Ohio State University. On the plane I saw a young boy with his dad, who said “This is his first college football game!” Passengers all around agreed this is quite a way to start. Friday night my other daughter Chrissie and I went to an NHL game, the Columbus Bluejackets vs the Colorado Avalanche. There were more fans in the crowd with their OSU red and gray on than the blue of the `Jackets--wearing blue on this weekend was not the thing to do! After the game, we took a drive around campus to see the RVs and their set-ups for tailgating and watching the game. RVs, scarlet and gray painted school busses, mini-vans and tents were set-up in every space available. What a sight! One site had a very large 5th wheel with extended roof, recliners, grills and a 50” TV; this set-up made the news the next morning. Saturday. GAME DAY. Went to breakfast at the Bob Evan’s next to the hotel, and saw all of the wait staff, cooks, and customers in OSU gear eagerly talking about the game. The game was scheduled for 3:30 pm; we were already walking from my hotel to the stadium at 9:30 am with a crowd of people, past a two-mile line of cars trying to get into already over-crowded parking areas. As we goet closer to campus, the walkway was covered with people shoulder to shoulder. One event that is always a must for me when I go to games is the OSU band’s “skull session” in St. John’s arena (the old field house—it holds approximately 10,000 people). This event, where the band performs all of the music that will played during pre-game and halftime, starts 2 hours before kickoff each game day; my job is to get into the arena early enough to get good seats to watch, and two hours usually does it. On this game day, we got to St. John’s around 10:45 am, thinking that we could take in a little bit of College Game Day with Lee [Corso] and Kirk [Hirbstreet] before getting seats. But there was a line at every door winding completely around the building! That’s something we’ve never seen before. After entering the arena, we watched it fill up bottom to top with red, which looked just like a thermometer going up! And it was just that fast; this was a full 2 ½ hours before the performance. When the band enters the arena, it assembles in one of the corridors in the corner of the floor area, with the drum major in the lead. The crowd stands and cheers in anticipation of the entrance. Then it happens: double-time quick steps and the band is on the floor in a flash. The fans all standing and clapping in time with the drums only add to the intensity. The next event on the skull session agenda is something that has to be unique to OSU. The football team spends the night at the on-campus hotel, which is across the street from St. John’s. They walk thru the crowd to St. John’s on their way to Ohio Stadium, known as the horseshoe or the ‘Shoe. Lead by Coach Tressel, the full team enters the arena and stands before the band. Each player is dressed in shirt, tie and jacket. One player speaks to the band and crowd, followed by Coach Tressel. This is just a wonderful moment and one that is heartfelt and very well done. After the team leaves the band rehearses the music for the day. 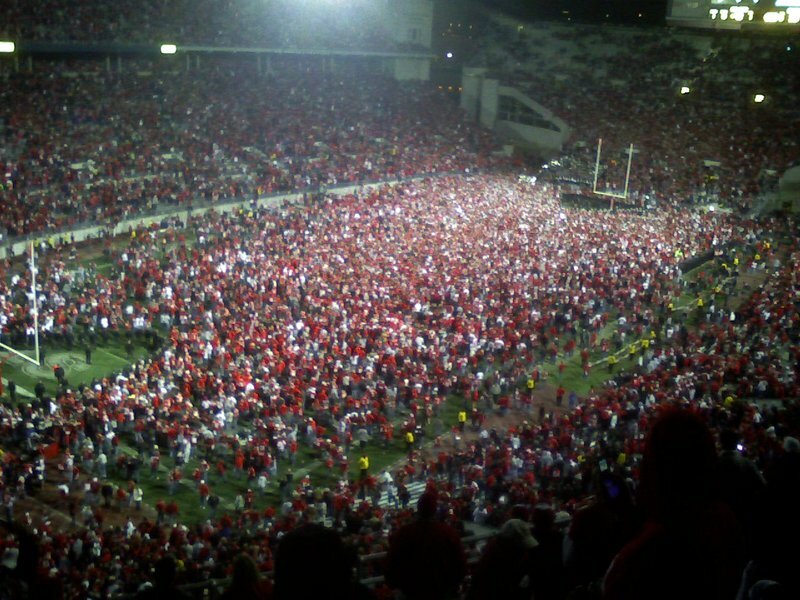 The walk to the ‘Shoe was wall-to-wall fans, some looking for tickets, and others trying to stay together in the crowd. Our seats were on “C” deck. As the name infers, it is UP many stairs just to get to the section, then my ticket took me to Row 38, out of only 41 available. Surrounded by newfound friends--students, fans that got tickets from students and season ticket holders, all just a few among the 105,708 packed into the ‘Shoe--I watched one of the most exciting sporting events I have seen in a long time. If you saw it you know what I’m talking about. It was just a track meet, each team just leaving it all on the field, two heavyweights refusing to go down. THE OHIO STATE UNIVERSITY prevailed and now I wait until January 8th for the next and final game of this terrific season. GO BUCKS! We did see it, here in Massachusetts, where it was just another Saturday. My mother and I agreed that we felt alienated and a little frustrated to be so far from the action--getting psyched up for the game feels a little strange when no one else knows what you're talking about. And while I still feel that the Red Sox-Yankees ALCS games I've seen in my brief lifespan are the most intense sporting events I've ever witnessed, from what my mother was telling me via my sister, the state of Ohio absolutely shut down prior to this game. In districts where ballot counts were scheduled, those counts were suspended prior to the "Michigan game" as it is known. High school playoff football games were postponed. A recent high-profile draftee to another small Ohio college, according to a friend of my mother's, showed up at his hometown high school's game on Friday wearing not his new team's colors but the scarlet and grey. At the very least, the intensity absolutely matches Red Sox vs. Yankees--but here, rather than the talk on the radio and TV being all about THE GAME, as it is when it's Sox-Yankees, it was just...ho hum. A very strange feeling. As for the game, college football is still just not to my taste. It's too high-scoring for me, too prone to back-and-forth like we saw in this game, which ended with a combined 81 points scored. But I had, I think, the key ingredient required for enjoyment of a college contest: a vested interest in one of the teams, knowing my father and sister were there, part of the scarlet-sporting, chanting, singing crowd, the massive voice booming "O!...H!...I!...O!" back and forth around the Shoe. As my dad said, Jan. 8 will be the championship game...and it could just be Ohio State vs. Michigan, one more time. If that happens, I can only imagine that the entire region of the Midwest between the Great Lakes and Kentucky will be swallowed up by the earth. I watched one of the most exciting sporting events I have seen in a long time. Fan of college football or not ('not', in my case), that pretty much says it all.